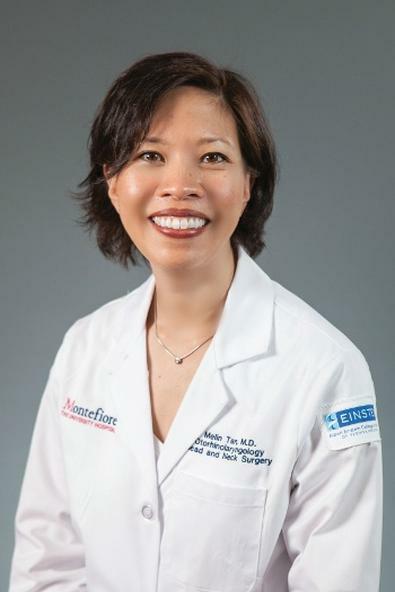 Before entering the medical profession, Montefiore Medical Center otorhinolaryngologist Dr. Melin Tan-Geller worked as a pianist, equipping her with a singular approach to the intersection between performance and vocal care. What advice do you have for optimal vocal performance? In general they should always warm up really well and cool down properly before rehearsals and performances, just like any other athletes would warm up and stretch prior to a race or game. Also, really good hydration. Lots of water and avoid instances of anything they identify as an irritation to their voices—and that’s usually something really specific. Some singers say it’s milk and dairy, others say it’s caffeine. But figure out a known irritant and eliminate it. Also, in the winter, oftentimes having a humidifier at the bedside helps, along with six to eight hours of time where you’re quiet and your voice can restore itself. What do many performers not know about their voices? A lot of singers don’t know or haven’t had the opportunity to learn what their larynx looks like and how it works. I think that at some point in their careers, if they take their voices seriously, just having an evaluation of their voices, even when completely healthy and normal, can be really educational for them. Can vocal abuse be reversed? Vocal abuse can absolutely be reversed. Often, the patient is completely unaware of the way in which his or her voice use is not healthy for the vocal folds. Reversal starts with an awareness of the vocal behaviors that are causing the problem, which can be assessed by a voice professional such as a laryngologist or a voice therapist. Are steroids a good option when singers need to recover vocal abilities quickly? Steroids are commonly prescribed for various medical illnesses and have a powerful anti-inflammatory effect that can help reduce edema in the vocal folds. At times, singers feel the need to reduce edema quickly for a performance or an audition and request steroids for this purpose. We caution against this as the effect of the steroids may mask another laryngeal problem, allowing the singer to ultimately overuse her voice when it should instead be rested. Additionally, in cases of chronic laryngeal edema, the edema will often return as soon as the steroid effect is gone, in which case, the underlying cause should be addressed. What's a commong myth about the voice? One is that the worst thing that can happen to a singer is nodules. Singers’ nodules are calluses that develop on the surface of the vocal folds at the point of maximal vibration as they produce sound, where the “trauma” to the vocal folds is the greatest. They’re akin to the calluses on the fingertips of a guitar player. As long as the “trauma” remains, the calluses will remain. But they are reversible with modification of voice use or technique, and rarely require any surgical intervention. Like this post? Check out more of our Inside Jobs!